Costa Rica is a rugged oasis that is any nature lover’s paradise! Well known for its rainforests, volcanoes, beaches, and biodiversity, you’ll always find something new to explore and enjoy here. To help plan your trip here are the best hostels in Costa Rica so that no matter what city/town you stay in, you’ll have a great experience that doesn’t break the bank. This new boutique hostel sits just two blocks from the University of Costa Rica and is surrounded by everything you could want. Tons of restaurants and bars are in walking distance, and if you feel like staying in for the night, some places even deliver. Begin your day with their continental breakfast by grabbing some of their famous pancakes and heading outside to eat while you take in a fabulous view of the city. 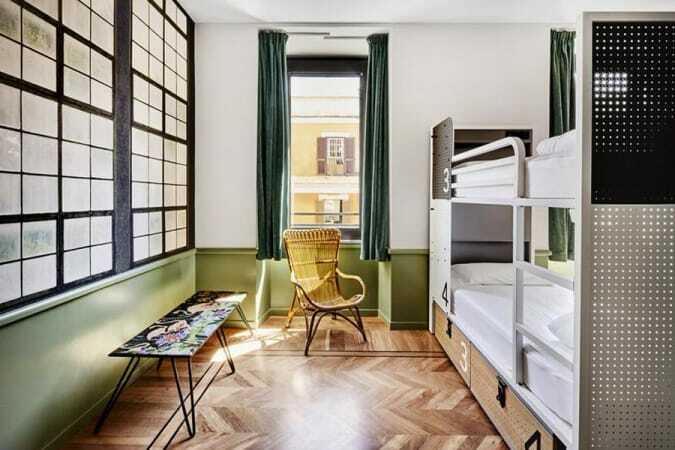 Hostel Urbano gives you a homey feel that you’ll quickly fall in love with during your time in San Jose. For the fans of politics, a stay at TripOn Open House will put you just 50 meters from the residence of Luis Guillermo Solís, Costa Rica’s current president. The complimentary breakfast is always a hit, but the staff is also kind enough to serve a healthy homemade dinner each night for a small fee. If you want to show off your own chef skills, there is a fully equipped kitchen for you to use. A nice garden with hammocks and a TV area with Netflix are just some of the thoughtful additions to complement your stay. The staff will ensure you have a wonderful place to come back to after a fun-filled day exploring the city. This hostel is perfect for those who love the peace of the countryside while still having easy access to the town centre. Just 15 minutes away you’ll find a gorgeous park with scenic trails where you can appreciate the many species of birds and other animals you’re sure to come across. After a beautiful day exploring the area, there’s nothing better than grabbing a cup of coffee, relaxing on the terrace, and overlooking the forest. For the nature lovers, Camino Verde is definitely one of the best hostels in Costa Rica. This small hostel packs a big personality and is located at the Monteverde Cloud Forest, giving you a true rainforest experience. The staff will make you feel like one of the family as they welcome you to Monteverde Backpackers. To help get acquainted with the area , they offer a free hike and sunset tour, but if you’d like to branch out then the staff is excited to help you book additional tours. 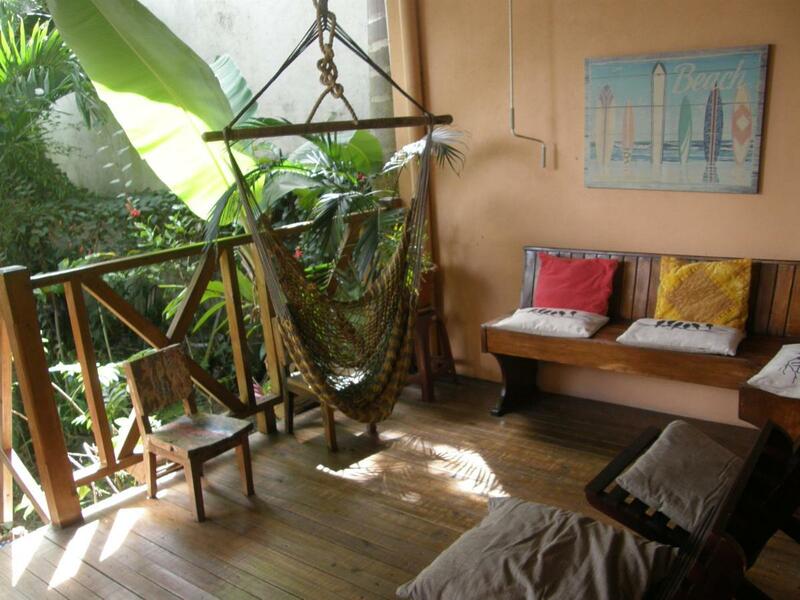 This 100% owned and run Costa Rican hostel is sure to provide you with an authentic and exciting stay throughout your time in Monteverde. 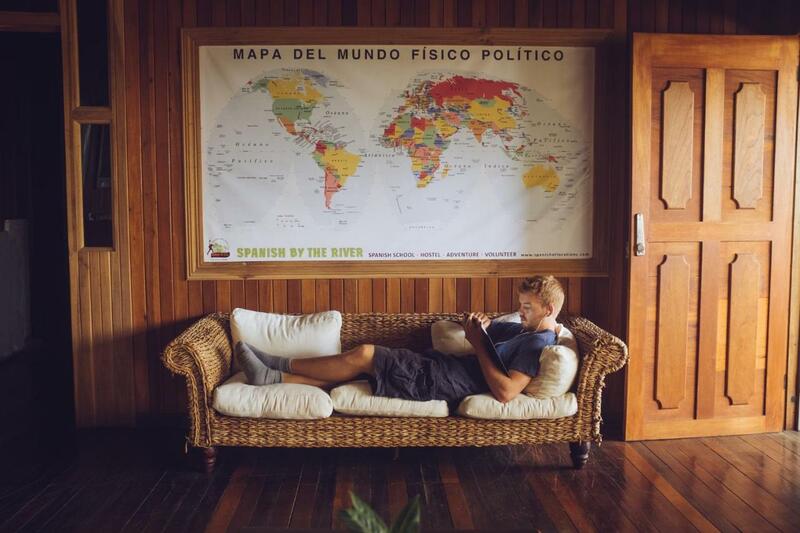 No other hostel compares after you leave Arenal Backpackers Resort. You’ll be welcomed by a stunning view of the Arenal Volcano as you take your pick of a private room, dorm, or funky safari tent. Once you’re all settled, it’s time for some fun. The on-site tour desk is at your service if you want to head out and explore the area. If you want to stay in, you can make your way to the swimming pool and wet bar, or relive your childhood with a game of Twister or a run at the slip ‘n slide. Just a few minutes from the city center, Arenal Backpackers Resort is a super comfy and exciting place to stay in La Fortuna. If you’re looking for one of the top cheap places to stay in Costa Rica, then Arenal Hostel Resort is a great home base for you. You’ll be in walking distance to all the action, but you’ll still be able to sleep peacefully. You can book a variety of thrilling tours directly through the hostel from ATVing to rafting to taking a canopy tour. When you’re ready to start winding down for the night, grab a drink from the bar, chill out in the garden, and enjoy the panoramic views. As soon as you arrive, you’ll be glad you chose to stay at Arenal Hostel Resort, one of Costa Rica’s finest gems. Sunset Hostel sets you up for an amazing time in Tamarindo. You’ll be just minutes from the beach, restaurants, and bars. If you need any recommendations, the owner Vicki is happy to point you in the right direction. The hostel even sits above a grocery store, so you have easy access to anything you need or forgot. One thing you won’t want to miss is the view and sunset from their terrace. From the friendly staff to the spotless rooms, Sunset Hostel has a great atmosphere, so don’t be surprised when you stay longer than you originally planned. 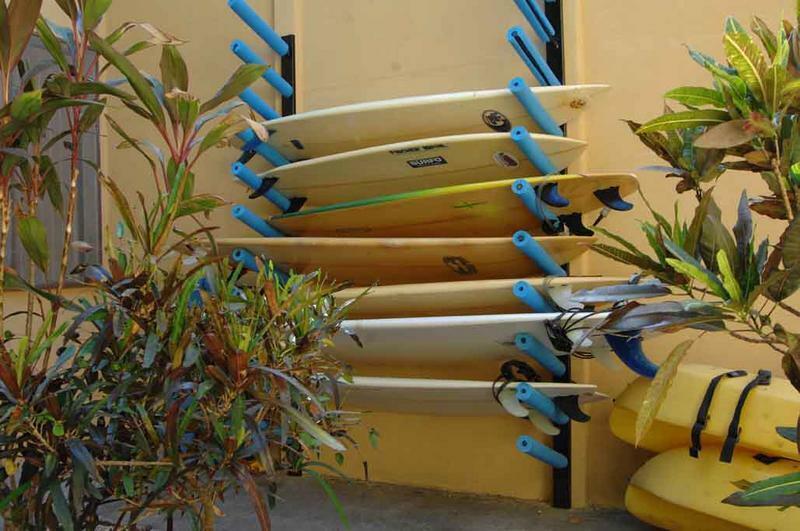 If you’re a surfer or want to be a surfer, then Coral Reef Surf Hostel tops the list of best hostels in Costa Rica for you. Miguel, the surf instructor, is at your service to give you lessons and take you to the best surf spots in the area. Not a surfer? Still check it out, since it’s one of the best cheap places to stay in Costa Rica. Not only are they right near two grocery stores and a food court, but they have their very own tasty dining options, Longboards BBQ and Shortboards Grill. 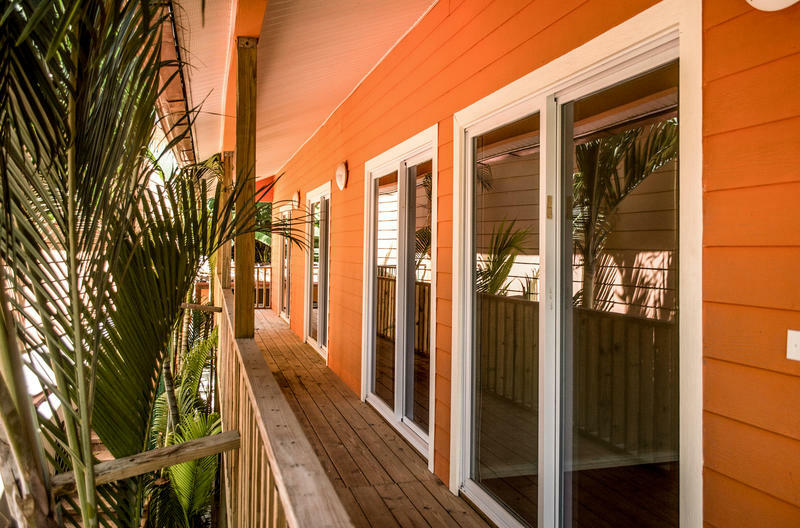 Jeff, the owner, has your comfort in mind when he welcomes you to Coral Reef Surf Hostel. If you’re wondering where to stay in Costa Rica for a quiet and nature filled stay, look no further than Hostel Plinio. Not only will you be surrounded by wildlife, but you’ll also have a nice ocean view. The staff does everything they can so you can have a refreshing stay. The pool, the patios, and the bar are just a few places where you can kick back and make new friends. 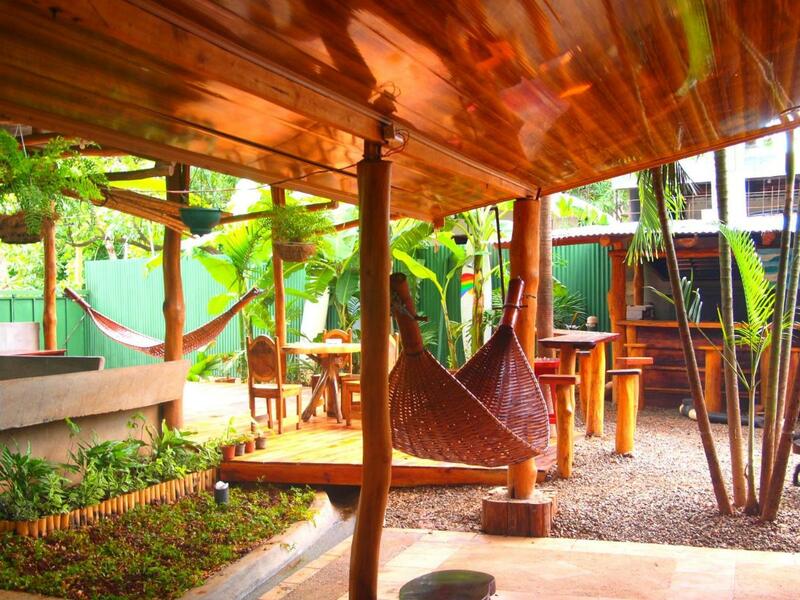 This rustic hostel gives you good vibes at a great price for your time in Manuel Antonio. Experience nature at its finest as the jungle and beach combine to create greatness at Selina Manuel Antonio. Get excited to be welcomed by the staff and maybe even some monkeys and iguanas. One of the best hostels in Costa Rica for the adventurers, Selina Manuel Antonio hosts a range of tours from whitewater rafting to parasailing to ziplining. If you’re here to relax or get some work done, they have two swimming pools, a deck with panoramic jungle views, and even a co-working space for your convenience. 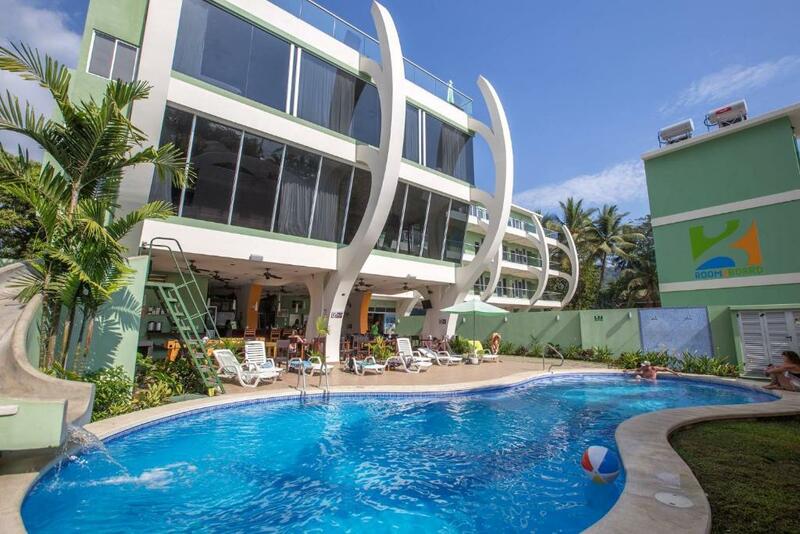 When the sun sets, this party hostel turns up, so you’re in for a once in a lifetime stay when you choose Selina Manuel Antonio. Get ready to have it your way at Kokua Hostel. 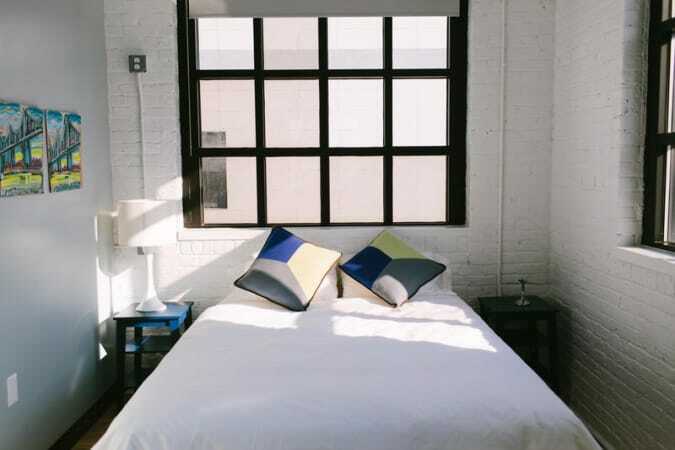 With so many sleeping options, all you have to do is pick where you’ll be most comfy. 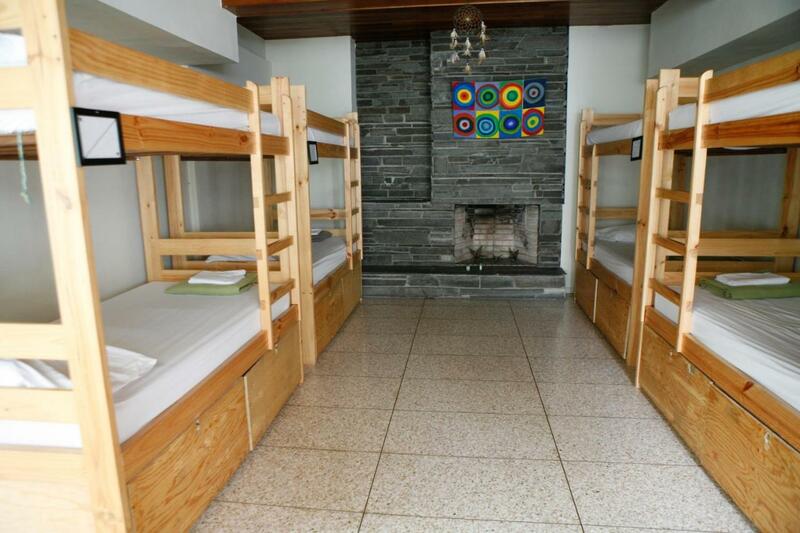 Along with dorms and private rooms, they also have a camping area, a camper van, and hammocks. They take their customer service to the next level as they offer group dinners, surfing lessons, and beach tours. Not only that, but they also have complimentary bicycles you use can. 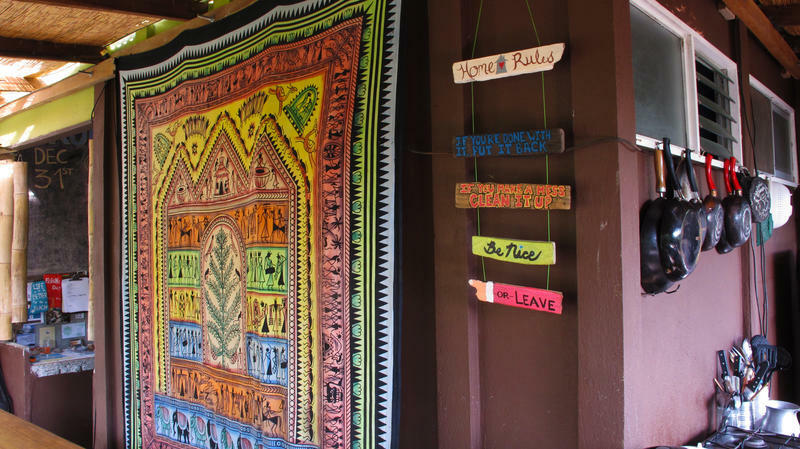 With such welcoming vibes, you can’t help but love Kokua Hostel. Just a two-minute walk from the beach, all the conveniences you need will be in walking distance. 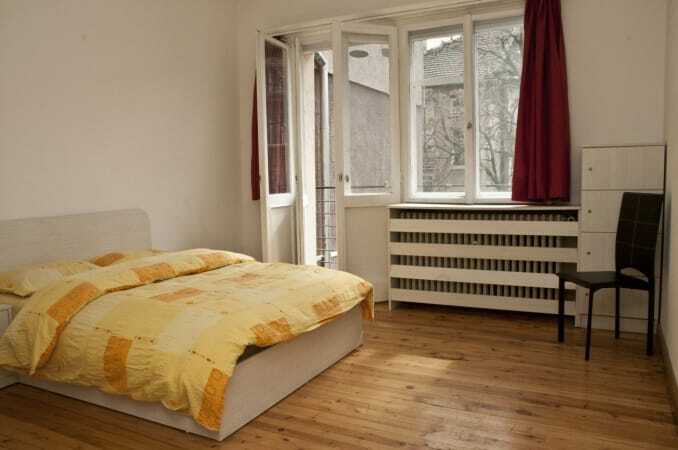 With double rooms, triple rooms, and dorms, whether you’re traveling solo or with a group, they have a comfy room for you. Don’t schedule any breakfast dates when you stay at Hostel Dos Monos, because you won’t want to miss their famous banana pancakes at the free breakfast. If you’re wondering where to stay in Costa Rica, then Hostel Dos Monos is an easy answer as they have a fantastic staff who truly care about their guests. 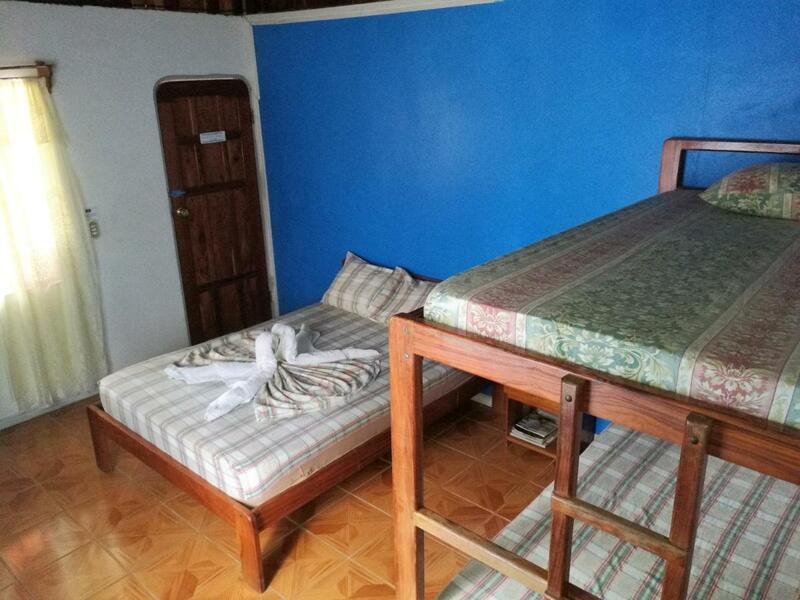 Kalunai Hostel offers you a great stay at an even better value as you’ll be located downtown, but also right next to the jungle for a quiet sleep. The staff is fabulous and you’ll want to make sure you hang out with the owners, Jordi and Cielo, as they’re super cool people and are happy to help with anything you need. You’ll love the common area because not only does it have an open layout, but hammocks and outlets decorate the space for your convenience. 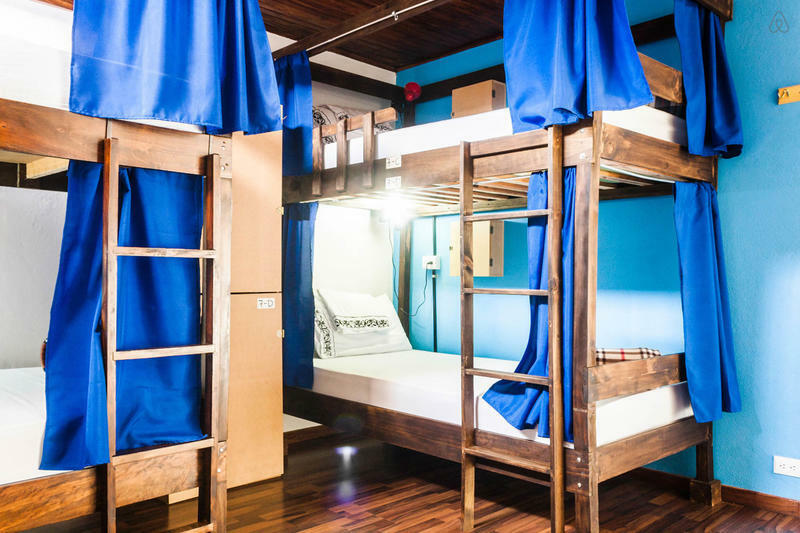 Expect to make a lot of friends here and have an amazing time at Kalunai Hostel. 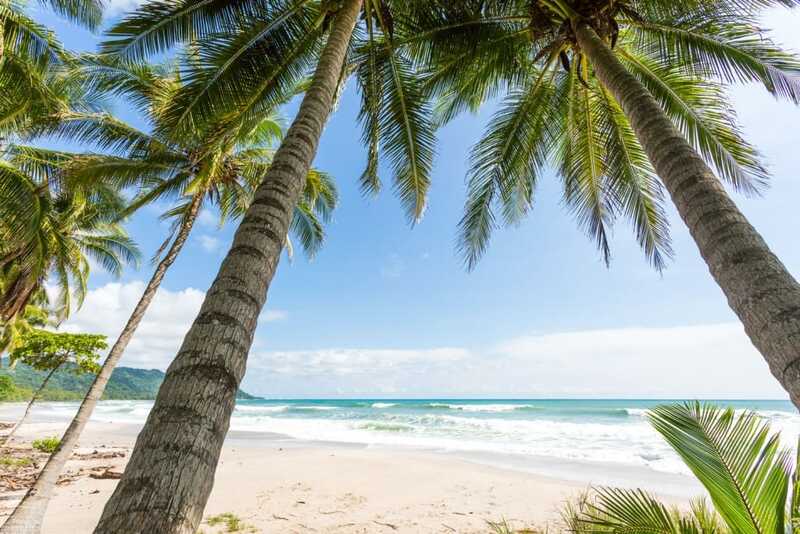 Great for the beach bums, you can hear the waves from Nosara Beach Hostel. Dee, the owner, is like the cool older sister as she welcomes you like family. Darts, ping pong, and foosball are only a few of the activities they have to keep you entertained. If you want to get out for some fresh air, you can rent a bicycle from the hostel or rent a surfboard from the surf shop next door. Three precious dogs also call Nosara Beach Hostel home, so get excited for lots of puppy cuddles. For a hotel-quality stay at a hostel price, Nosara Beach Hostel highlights the list of best hostels in Costa Rica. With so many highlights, Hostel Casa de Lis is the perfect place for just about everyone staying in Costa Rica. If you don’t want to stay in San Jose, but want easy access to the airport, Hostel Casa de Lis is a great option for you. For the adventure lovers who want to take advantage of rafting, canyoning, and other outdoor activities, it’s one of the best bases you’ll find. After a long day of excitement, head up to the second story terrace for amazing views as you watch olcano Turrialba erupt in the distance. Considering all that it has to offer, plus the multilingual staff and the central location, Hostel Casa de Lis is an obvious addition to our list of best hostels in Costa Rica. With views for days, Spanish by the River overlooks mountain valleys that house world-class rivers, a volcano, rainforests, and the charming town of Turrialba. A true Costa Rican experience! At Spanish by the River, you’ll close to shops and anything you could need. And depending on when you stay, you can take advantage of the weekly farmer’s market. With abundant wildlife in the area, don’t be surprised if you see toucans, sloths, and other cool animals. There are even gorgeous waterfalls nearby, just ask the staff where to look. With so many cool activities available, from Spanish lessons to dance classes, you’ll never be bored with a stay at Spanish by the River. 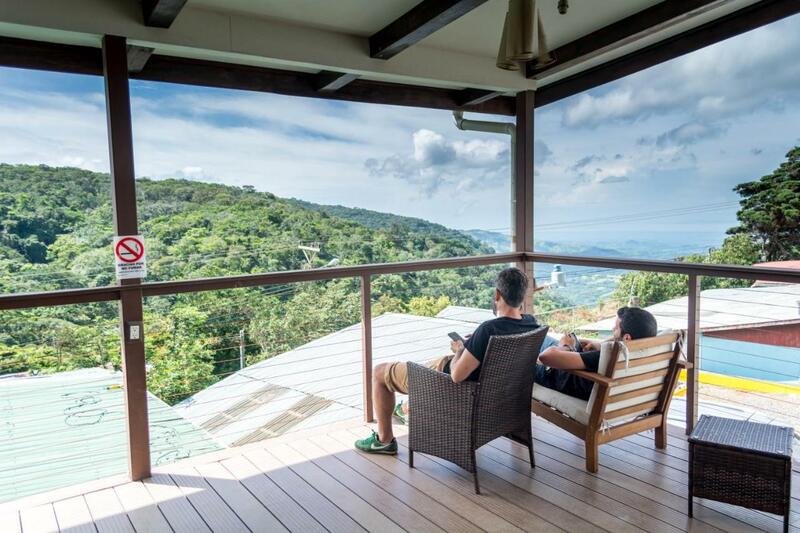 This award-winning hostel is perfectly situated in the rainforest above Utiva’s Marino Ballena National Park. The beautiful coast of Puntarenas and the picturesque Utiva Waterfall will give you a lot to love when you stay at Cascada Verde. The open-air treehouse provides you with once in a lifetime views from the terrace and the relaxing sounds of nature and wildlife. With many on-site activities and daily tours, you’re sure to have fun and learn throughout your time here. For a great stay away from the tourist crowds, Cascada Verde always makes the list of best hostels in Costa Rica. 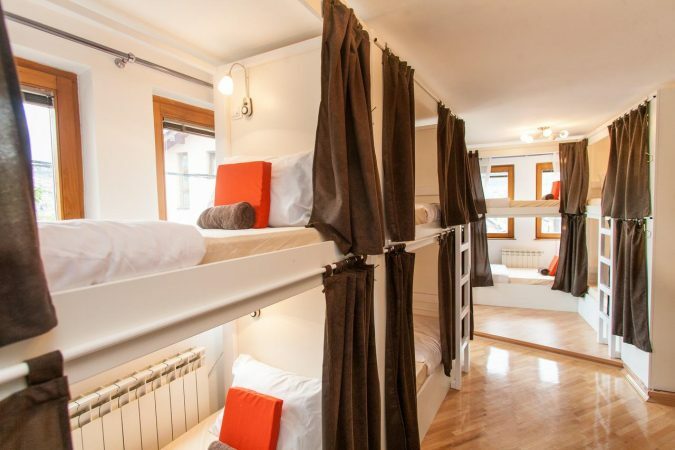 There’s a reason why Room2Board Hostel has been named one of the best surf hostels in the world and you’re sure to agree even after a short stay. Adventure awaits here as you can take advantage of surf lessons, stand-up paddleboarding lessons, and a host of tours, including everything from ATV tours to crocodile tours. When you need some time to refresh, you can hang out in the movie room or grab a drink from the bar then head up to the rooftop terrace and admire the sun setting over the ocean. Brian, the owner, and Carolina, the general manager, have created a fantastic boutique hostel that you’ll never want to leave. Riva Hostel Jaco is the perfect place to stay to enjoy the beach and the nightlife, while still getting a good night’s rest. Not only will you be in walking distance to all the conveniences you may need, but you’ll have free access to Jaco’s Beach Club where you can take advantage of two swimming pools, a restaurant, and a bar. After a long day of exploration, take your pick of their tents or dorms to rest, refresh, and get ready for the next day. Charlie and Laura have done a great job of creating a sense of community at Riva Hostel Jaco, so expect to make new friends and have a blast. If you’re a nature-lover looking for a digital detox and wondering where to stay in Costa Rica, then Bolita Rainforest Hostel should be high on your list. Bordered by Corcovado National Park and the stunning Rio Tigre, and located on over 61 hectares of rainforest, a stay at Bolita will feel like paradise. As an electricity free hostel you’ll be truly immersed in nature as you enjoy one of the many g hiking trails, hidden waterfall swims, and exciting river walks on the hostel grounds. Another added bonus is that you’ll get to try some fresh tropical fruits grown right on the property :) The open-air sleeping options allow you to rest in absolute comfort as you can choose from the dorm or private room, in the original farmhouse or try out one of their new cabinas. To experience the local culture and the beauty of untouched jungle, you’ll want to book a stay at Bolita Rainforest Hostel ASAP. For those who love to stay busy with tours and activities but have a budget to stick to, Corcovado Wild Hostel is one of the best cheap places to stay in Costa Rica. From turtle tours to whale watching to snorkeling, there are endless activities for you to take advantage of. Christian, the owner, specifically specializes in Corcovado National Park, so not only will he welcome you to the hostel, but he is also an excellent guide if you want to explore Corcovado National Park. 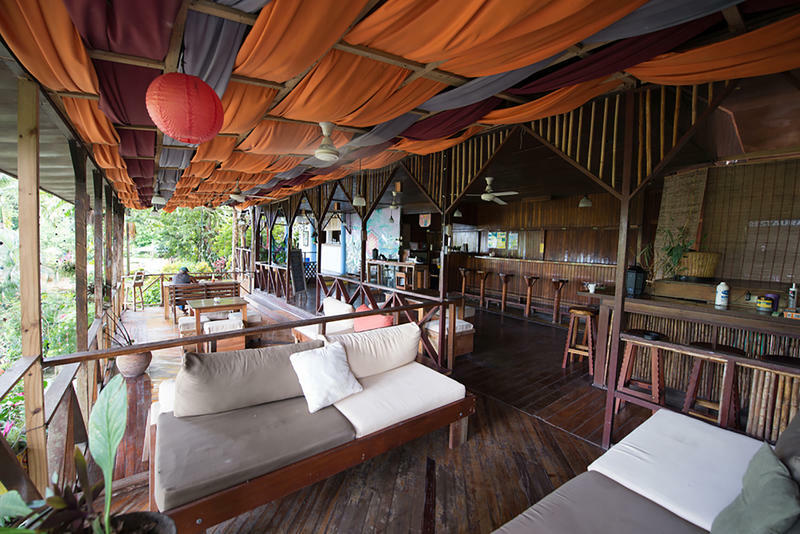 After a long day of action, you’ll love the calming and peaceful vibe of Corcovado Wild Hostel. Housed in one of the most remote areas of Costa Rica, Jungla del Jaguar is a paradise where the sea meets the rainforest. You’ll be welcomed with a trail map of nearby lagoons, waterfalls, beaches, and even a lively bat cave. Feel free to explore the rainforest on your own terms, or you can take advantage of their guided jungle night hike or canopy climb tour. If you’d like, they are also teach you about jungle survival, and you may even have the opportunity to learn about medicinal plants and trees along with how to make coconut oil. If you’re looking to unplug and just appreciate the beauty of nature, Jungla del Jaguar tops the list of best hostels in Costa Rica for you. If you’re looking to donate to a great cause while having an even better stay in Costa Rica, then Drake Bay Backpackers is the place for you. They do offer the typical tours, but they also offer community-based and ecotourism activities while donating all of their income to the environmental programs of the Corcovado Foundation. Housed in the tiny village of El Progreso, you’ll have the opportunity to language swap with locals, fish for your dinner, take environmental education classes, learn how to make empanadas with a local family, and much more! Along with the hostel kitchen where you can whip up your own meals, a local chef prepares delicious breakfasts and dinners for guests and volunteers. If you’re looking for an authentic stay that’s off the beaten path, then Drake Bay Backpackers is an amazing choice for your time in Costa Rica. If the hip, artistic town of Montezuma is calling your name, then Luz en el Cielo is the best option for your visit here. This classy hostel puts you right near the downtown area and just a short hike from amazing waterfalls and exciting wildlife. 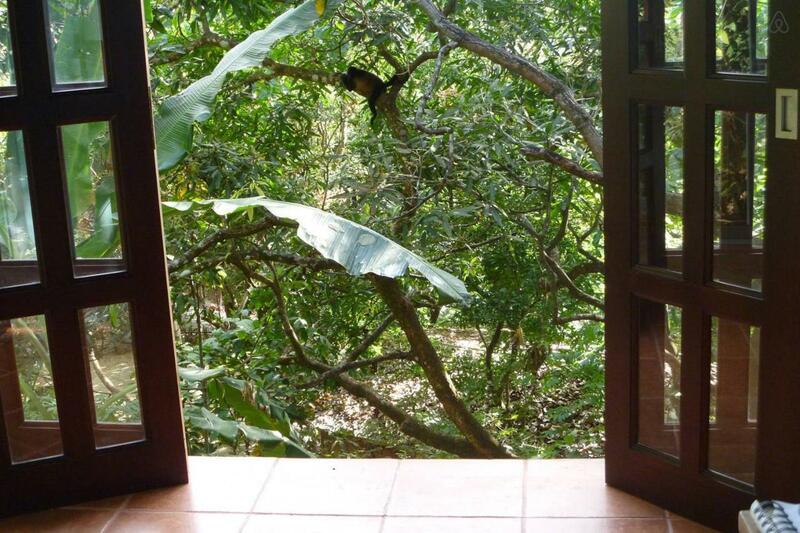 Not only will you enjoy the company of other travelers, but you’ll probably meet some friendly monkeys while you chill on the veranda. A complimentary organic breakfast will start your day right before you head out for an action-packed day. The staff is excited to help you create unforgettable memories during your time in Costa Rica, so you can be confident you made the right choice with Luz en el Cielo. As you enter, the warm hospitality and unique artwork will make you feel right at home. The owners, Shawn and Jesus, have amazing senses of humor and will not only greet you with a smile, but also with a helpful map of the area that includes shops and restaurants. You’ll have quick access to the city market and main bus terminal, and you’ll also be close to waterfalls, beaches, and parks. They know relaxation is key, so hammocks abound whether you want to chill on the front porch or in the back garden. We know, you’ll be well taken care of during your stay at Hospedaje Dodero. One of the great highlights of Aracari Garden Hostel is its location. Located near Tortuguero National Park, you can have some amazing experiences like watching the birth of sea turtles and canoeing through the canals. The staff wants you to have a comfortable stay, so if there’s anything you need, don’t hesitate to ask them. The town of Tortuguero is easy to explore, as there are no cars so you can safely walk the streets. If you’re excited to know more about the area, they even offer a tour where you can learn more about it and meet the locals. 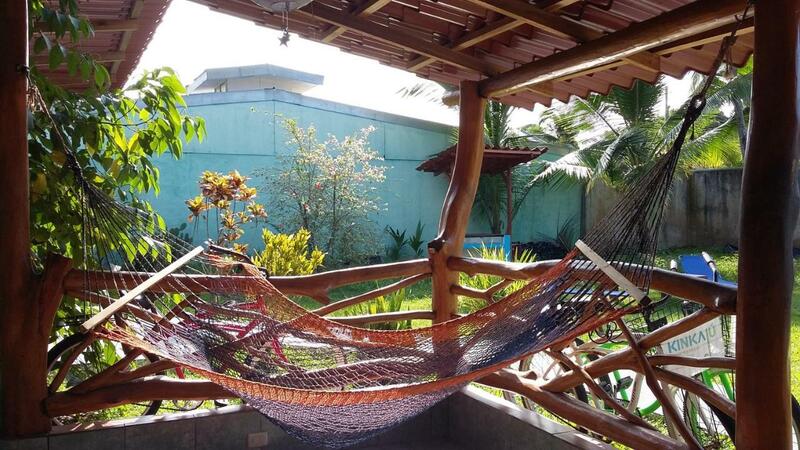 If you want to know where to stay in Costa Rica to enjoy the tranquility of nature, Aracari Garden Hostel is one of your best options in Tortuguero. 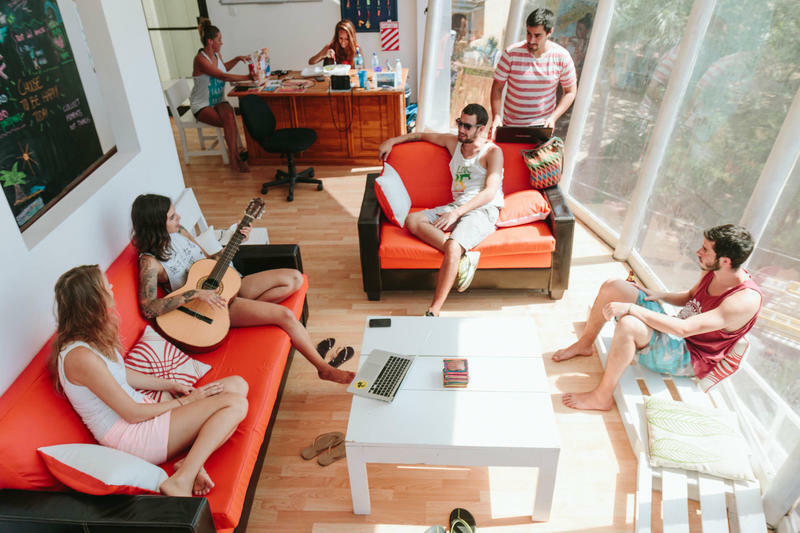 Now that your stress is gone and you know where to stay in Costa Rica, no matter if you’re coming to relax, surf, party, or explore nature, you can be confident you chose one of the best hostels in Costa Rica. This list is based on our personal experiences and/or reviews online. 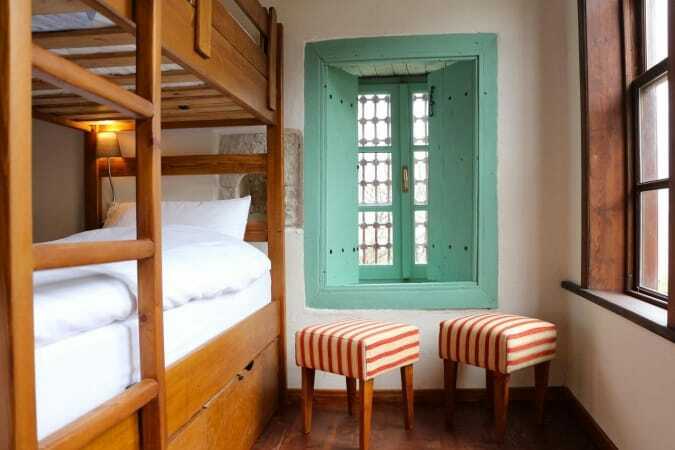 If you own a hostel in Costa Rica that you would like to add to this list, email us at contact(at)roadaffair(dot)com with the subject: Best Hostels in Costa Rica.